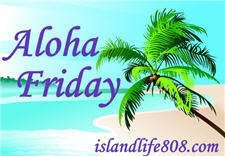 It is Aloha Friday over at Island Life Aloha Friday is where you take it easy and get ready for the weekend. Trip to the amusement park, beach, and camping planned, as well as the kids and I are going to Colorado for two weeks. Trips to see family & lots of fun (water park, zoo, etc)! It's my little one's first time at all this stuff. I love it. We don't really have set plans but I am hoping to include a couple trips to the beach and maybe the zoo. Ah! My hubs and I were going to go to Colorado in July, but are remodeling the kitchen that week instead. I want to see lots of pics!!! Survival !!! Too much going on at the moment to get away :(.